When the Duke and Maryland women’s basketball teams tip off this afternoon at Spokane Veterans Memorial Arena, it will be the ninth time since 2001 that Washington State University has hosted championship NCAA basketball in town. The marquee event, which will later pit the hometown underdog Gonzaga women against perennial powerhouse Tennessee, came to Spokane in the waning minutes. That was in July, when original host Sacramento abandoned its bid to host the regional finals of the tournament. Hoops fans there will have to settle for a Garth Brooks concert, while WSU continues to push its exposure in the Lilac City and pocket ticket sales topping $35,000, Deeds said. Deeds said it will take dozens of volunteers to pull off the event this weekend and praised the assistance of arena staff. “They’d host it every year if they could,” he said. The NCAA has pushed hard to standardize the look and feel of the tournament in recent years. The four host sites for this weekend’s games – Spokane, Albany, Greensboro and Oklahoma City – all received a 112-page packet of regulations that address details such as the size of logos on pep band uniforms (they can’t be more than 2 ¼ square inches in area) and the designs of souvenir cups served at concession stands. They also submitted budgets to the NCAA for reimbursement of marketing fees and other approved expenses. While the regulations restrict the ability of host schools to market their brand, they also provide a blueprint for institutions making their first foray into running an NCAA championship event, said Rob Spear, athletic director at the University of Idaho. UI will host next year when the men’s tournament returns to Spokane, the first time the Vandals have hosted the tournament. Spear said his staff will observe operations in Spokane this weekend in preparation for the March 2016 games, and traveled to Key Arena in Seattle last weekend to see how the men’s games went off with the University of Washington as host. Not everyone wants to commit to the time and energy required to host the games, however. 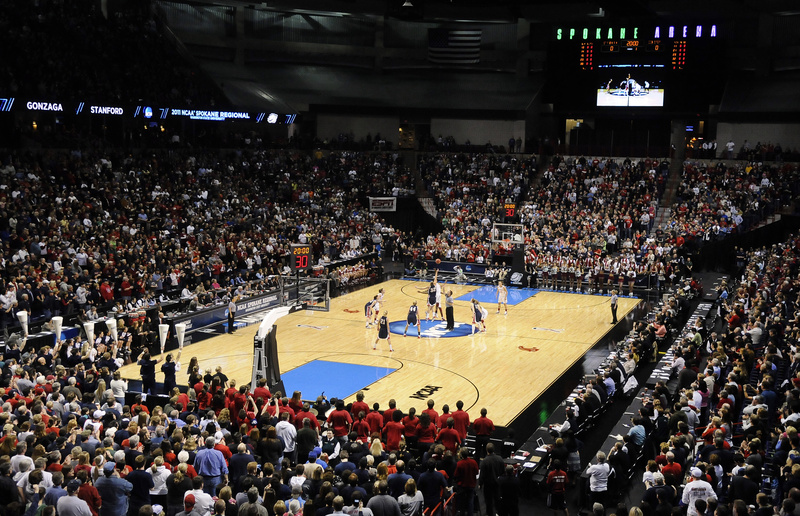 Host schools for the men’s tournament are not allowed to play at their own sites, which would rule out a potential appearance at Spokane Arena in a future tournament, said Mike Roth, Gonzaga’s athletic director. “We took all that in mind as we made our decision not to host,” Roth said, though the school has had discussions with Spokane Arena floating the idea. McCarthey Athletic Center was the site of the women’s first and second round games in 2011, 2012 and 2013, but there’s no restriction on the women playing on their home floor in that tournament. Deeds said his staff will be working hard this weekend, but the event provides invaluable experience and an opportunity to be part of history. “I always say, it’s a lot of hard work, but it’s something that’s really cool to be part of,” he said.